An embolus is a particle or mass (most typically, a blood clot) that travels through the bloodstream. An embolus may subsequently lodge in a blood vessel, producing blockage and causing organ damage. The plural of embolus is emboli. When organ damage is caused by an embolus, doctors will often say that an embolic event has occurred. An embolus may consist of a blood clot, fat, air, pus, cholesterol, amniotic fluid, or a foreign body. The most common cause of an embolus is a blood clot that has broken loose from its site of origin. The terms embolus and thrombus are often confused. A thrombus is a blood clot that forms within a blood vessel. If a thrombus breaks free and travels through the bloodstream, it has become an embolus. Doctors may refer to a thrombus that has become an embolus as a _thromboembolism_. 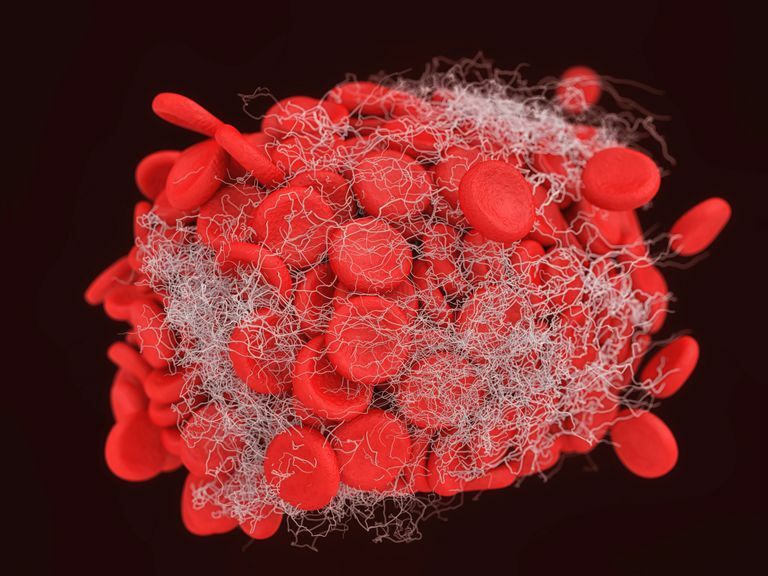 When a blood clot or any other form of embolus travels through the bloodstream, it is inevitably carried through smaller and smaller blood vessels until it becomes lodged, and obstructs further blood flow through that vessel. The tissue being supplied by the blocked blood vessel then becomes starved for oxygen and nutrients, and is likely to die. So an embolus is a problem because it often causes tissue damage or death. The larger the embolus, the larger the blood vessel it blocks, and the more tissue damage it causes. If an embolus is traveling within the veins, it usually becomes lodged in one of the pulmonary arteries, causing a pulmonary embolus. If an embolus is traveling within the arteries, it can end up damaging almost any organ in the body. Blood thinners are used to reduce the risk of tissue damage by thrombosis and emboli in people who are at increased risk. A **pulmonary embolus** is an embolus (most typically, a blood clot) that travels to the lungs and produces lung damage. A pulmonary embolus is most often caused by deep venous thrombosis in the legs. A **cerebral embolus** is an embolus that lodges in an artery supplying the brain, producing a stroke. A common cause of cerebral emboli is atrial fibrillation. In fact, a major goal of treating atrial fibrillation is to prevent embolic stroke. A fat embolus can occur when the fracture of a long bone releases droplets of fat into the bloodstream. Fat emboli most often travel to the lungs or to the brain, producing pulmonary embolus or stroke. A septic embolus is a mass of bacteria-containing tissue or pus that enters the bloodstream from a site of infection. Causes of septic embolus include infectious endocarditis or an infection at the site of an intravenous catheter. An air embolus is caused by small amounts of air that can get into the circulation during a medical procedure (such as surgery or a catheterization procedure). A cholesterol embolus is caused by the release of cholesterol crystals from an atherosclerotic plaque. These crystals can lodge in an artery downstream from the plaque and cause tissue damage. Cholesterol emboli most commonly occur with peripheral artery disease, and the damage they cause depends on the location of the plaque. Manifestations may include painful blue toes, gangrene of the lower extremities, skin discoloration, kidney failure, abdominal pain, intestinal bleeding, stroke, or peripheral nerve disease. An amniotic fluid embolus is a rare emergency associated with childbirth. It is caused by amniotic fluid, or cells shed from the baby, entering the mother’s circulation through the placental bed. The damage done to the mother with an amniotic fluid embolus is usually not caused by the embolus lodging in a particular location, but rather, is caused by a general, often overwhelming, allergic reaction to “foreign” tissue. An amniotic fluid embolus is an extremely dangerous event which is often fatal. A foreign body embolus is another rare event, usually associated with a medical procedure. For instance, talc entering the bloodstream can become an embolus. A “paradoxical” embolus is an embolus originating in a vein that ends up lodging in an artery. A paradoxical embolus requires a pathway from the right side of the heart to the left; for instance, via a patent foramen ovale. An embolus can produce tissue damage or death in almost any organ in the body. Lung damage (by a pulmonary embolus) and stroke (by a cerebral embolus) are two common conditions caused by emboli. Preventing embolic disease is the main reason blood thinners are used so often in clinical medicine. Tagalakis V, Patenaude V, Kahn SR, et al. Incidence of and Mortality from Venous Thromboembolism in a Real-world Population: the Q-VTE Study Cohort. Am J Med 2013; 126:832.e13. Gould MK, Garcia DA, Wren SM, et al. Prevention Of VTE In Nonorthopedic Surgical Patients: Antithrombotic Therapy and Prevention of Thrombosis, 9th ed: American College of Chest Physicians Evidence-Based Clinical Practice Guidelines. Chest 2012; 141:e227S. Ho KM, Bham E, Pavey W. Incidence of Venous Thromboembolism and Benefits and Risks of Thromboprophylaxis After Cardiac Surgery: A Systematic Review and Meta-Analysis. J Am Heart Assoc 2015; 4:e002652. Can You Consume Too Much Fiber in Your Cholesterol-Lowering Diet?